Laissez les bons temps rouler. 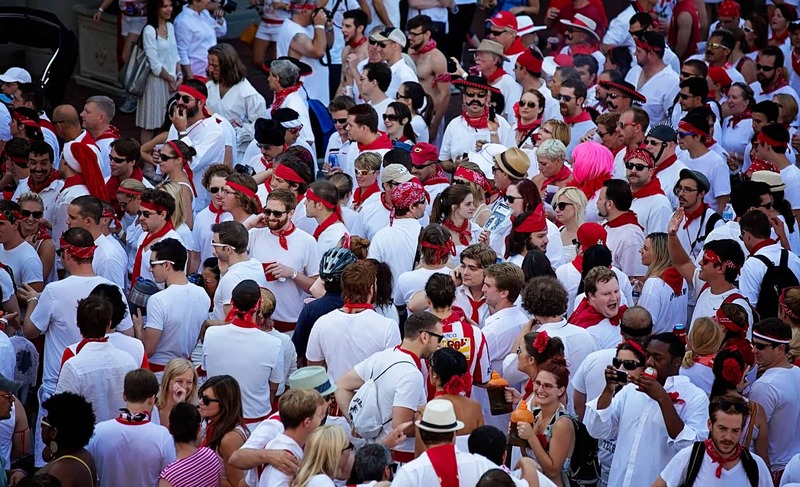 If ever a New Orleans event exemplified that theme, it is this — the San Fermin in Nueva Orleans Festival. This post, like this event, has elements that are not child-appropriate, so if you’re under the age of 18, here are some kittens. 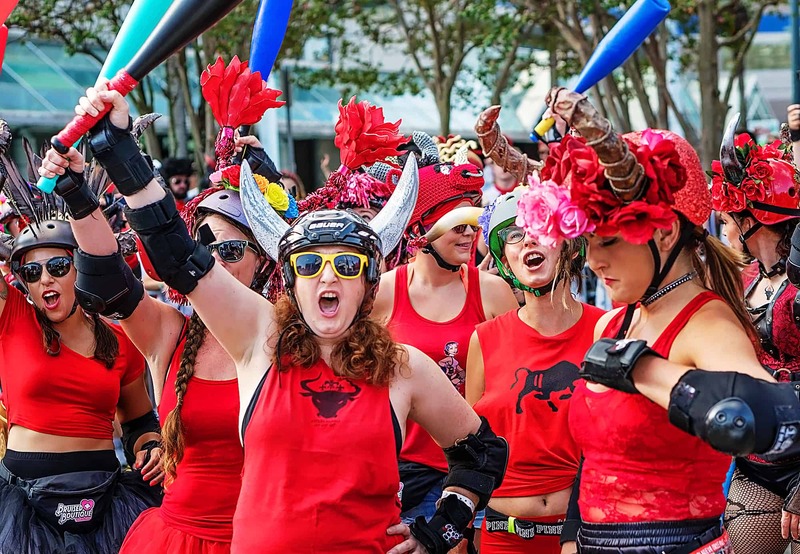 What is San Fermin in Nueva Orleans? In short, it’s a weekend-long, sangria-soaked taste of Spain, New Orleans-style. Have you heard of the Running of the Bulls in Pamplona, Spain? 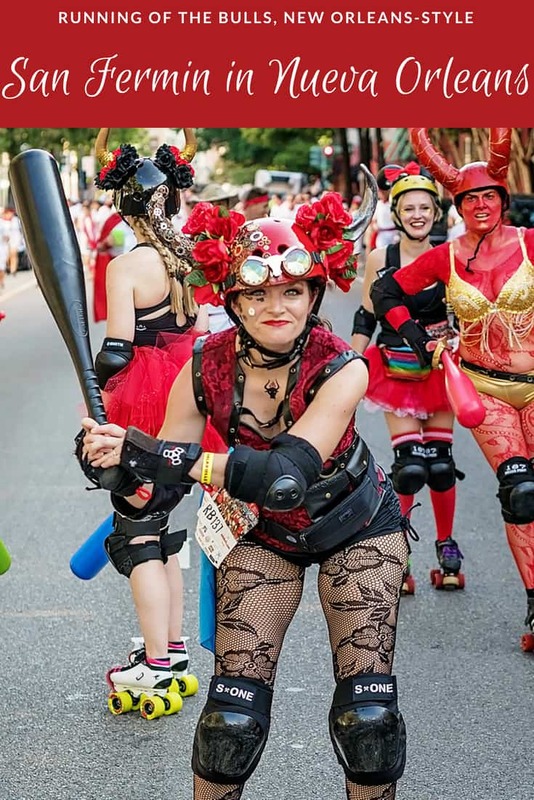 San Fermin is loosely based upon that tradition, except instead of bulls, you have the Big Easy Rollergirls and ladies from other roller derby leagues across the country who chase runners down, try to “gore” them with their horned helmets, and smack them with plastic Wiffle Ball bats. The debauchery begins Friday night with, what else, a party. 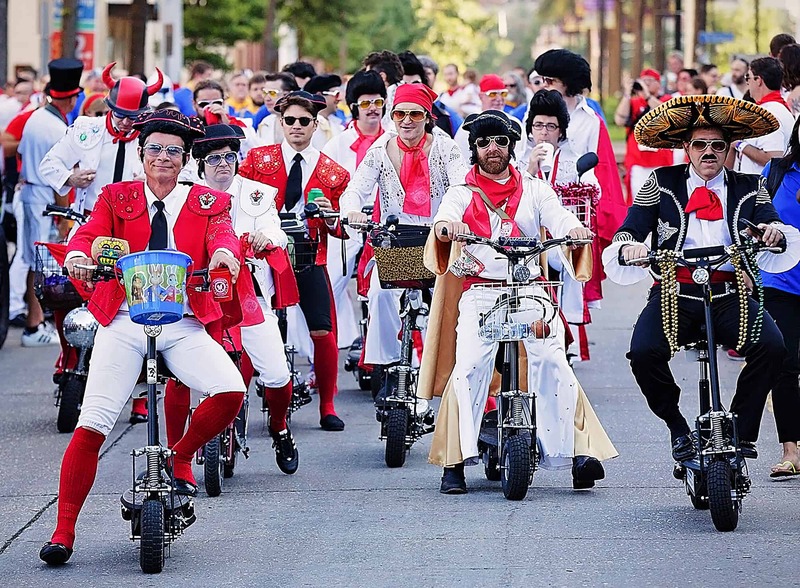 El Txupinazo (pronounced choo-pin-AHT-so), referring to the rockets that mark the start of Pamplona’s Running of the Bulls and other festivals. There is booze, food, and music — pretty much like there is at all Louisiana festivals. A $60 ticket will give you access to the open bar, live music, and food from local restaurants. But there’s a catch — you can’t drink too much or you will completely miss the main event on Saturday, which kicks off at 6:30 a.m. with the opening of the bars. 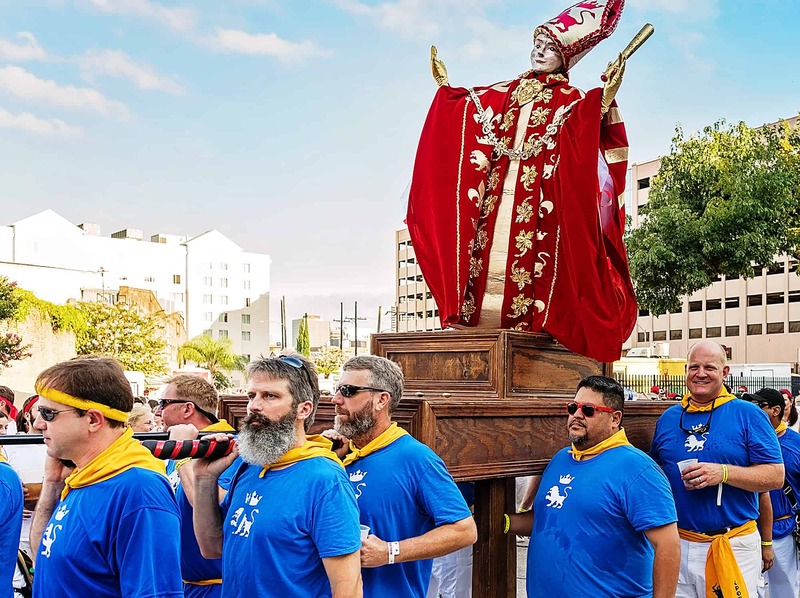 The day begins with a Spanish-themed procession and blessing honoring Saint Fermin, who was martyred in 257 AD by being tied to a bull and dragged to his death. Believers say a sweet odor emanated from his body after he died, melting snow and ice, causing flowers to grow spontaneously, causing trees to bow down toward his body, and healing the sick who were present. The main event, El Encierro (Running of the Bulls), begins at 8 a.m. sharp and only lasts 15 minutes, so pay attention to the time. A few things to keep in mind: Runners must wear a white shirt and white shorts or pants, with something red tied around their waists and necks. If you fall down, stay down, and do not stand still at any point unless you want to be rolled over or trampled. Whether it’s people or bulls, and whether you’re drunk or sober, you don’t want to end up beneath feet, hooves, or wheels of any kind. Oh, and one more thing — don’t touch the bulls. Sure, the bat-wielding ladies are pretty, but don’t touch them. That’s just rude (and also not allowed). After the running commences the drinking — unless, of course, you decided a sangria-soaked run in July heat was a good idea, in which case, party on. The post-run party is just a warm-up for the post-post-party fiesta, La Fiesta de Pantalones, or the Party of the Pants. You’re not required to wear pants, and after drinking tequila all day, odds are good you no longer have any. Still, you’re encouraged to continue the white and red-themed apparel and get as creative as you want with your costume. The weekend craziness concludes with El Pobre de Mi, also known as the Poor Me Post-Hangover Party. If the best cure for a hangover is the hair of the dog that bit you, you’re in luck. There will be plenty of alcohol flowing, and you can enjoy a tapas brunch while watching the Ernest Hemingway look-alike contest. If you’ve ever wanted to see a drunken New Orleanian wearing a fake mustache and quoting from The Sun Also Rises, this is your jam. (Or you could just walk down Bourbon Street 24/7/365). In Spain, the Running of the Bulls weekend culminates with the crowd singing “Pobre de Mi” as a lament to the party’s inevitable end. But in New Orleans, does the party ever really end? Tickets are $60 per person, which includes food, drinks, tax, and tips. 100 percent of the ticket price is donated to Beth’s Friends Forever (BFF) https://www.bethsfriendsforever.org/, which provides resources for women fighting cancer in Greater New Orleans. 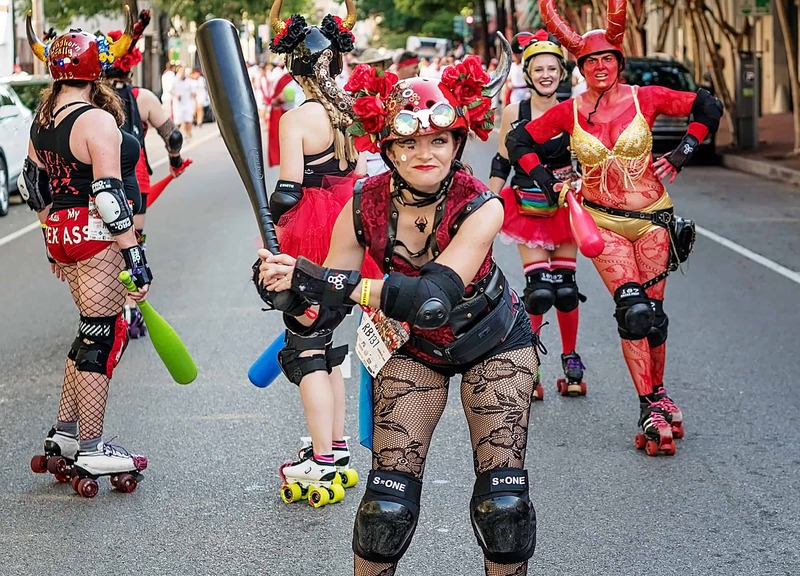 Open to the public for free, but participants are asked to register https://www.eventbrite.com/e/san-fermin-in-nueva-orleans-2018-the-running-of-the-bulls-tickets-35851735506. Tickets are $25-$80. Proceeds benefit Beth’s Friends Forever and Animal Rescue of New Orleans. Runners are required to wear a white shirt of any kind, white pants, and some type of red cloth around their waist and neck. Alcohol will only be served to those 21 years or older with a valid driver’s license. Want to find more cool festivals in the South? 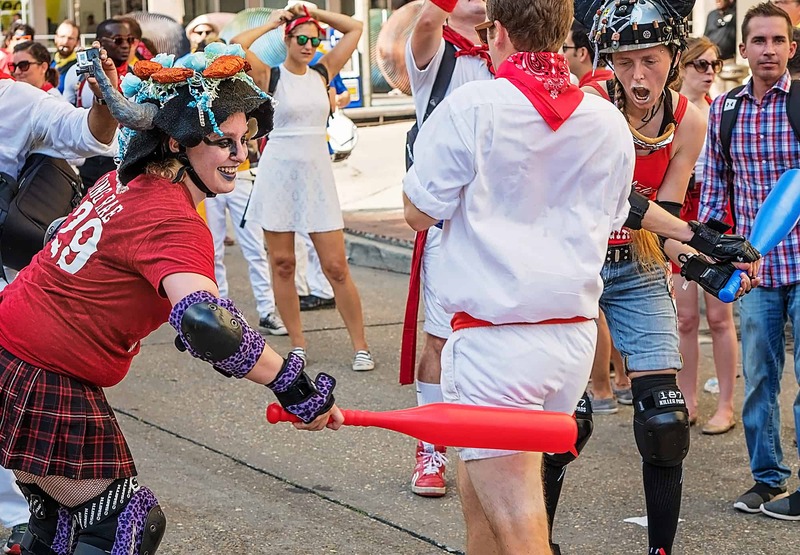 Check out the Louisiana Peach Festival in Ruston, Louisiana, or attend one of these 7 weird Alabama festivals.